WARNING: The Graceland photos are highly spoiler-rrific. You’ve been warned. 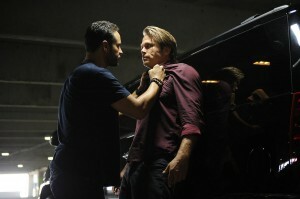 TheÂ Graceland season finale is going to be out of control. After the events of “Echoes,” that’s the only way it can go. 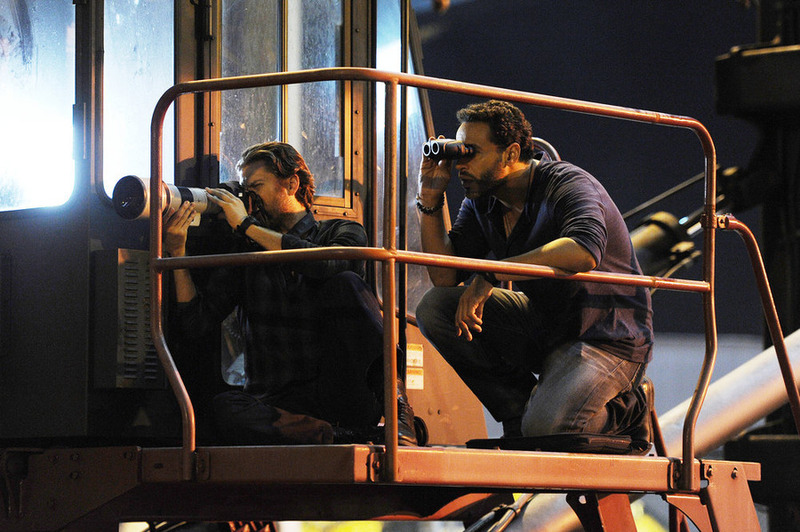 Synopsis for “Faith”: As the arrests of Sid (Carmine Giovinazzo) and the Solanos near, even the best laid plans begin to crumble. Charlie went after Amber and got kidnapped for her efforts. Amber (Brit Morgan) and a couple of her goonsÂ blindsided her car and then dragged her into their van. She’s on her own. What does Amber want? Will Charlie be forced to reveal who she really is? Who will come to her rescue? Will she be able to get herself out of this? And with all this danger and stress in her life, will her baby make it through this ordeal? Hope so. To borrow a character name from HBO’s Entourage, weÂ think we need to start referring to our man Johnny as Johnny Drama. He’s been flirting with danger for a while now. Emphasis on flirting. Looks like Carlito (Erik Valdez) finding out about his crushÂ being with his sister (Lucia, Jamie Gray Hyder) doesn’tÂ go well. On top of that, Johnny made Carlito look bad with his father. We don’t know if Johnny’s noticed but Carlito has a bit of a temper. From the photos, it looks like he doesn’t hold his jealousy and anger in. He lets it out. Big time. And that’s not Johnny’s only problem. He’s been lying to Lucia about who he is. How will she react when she finds out he’s a fed and he’s been completely dishonest with her? Johnny’s been naive about this whole thing. It’s not going to turn out well. Someone will get hurt.Â Or worse. What do you guys think of season two Mike? It hasn’t felt like he’s really been part of the Graceland abode. He came back to spearhead his drugs on busses project and from the moment he basically toldÂ everyone they were working for him, there hasn’t been as much of the bonding weÂ would have liked. He’s been a bit judgmental and he’s been so laser focused on proving himself and validating his theories that he’s let things veer out of control. He didn’t admit to Paige that Lina died. He instead made it look like she escaped. When it fact Lina was killed and Mike cremated her body. So there’s goes the promising relationship he had with Paige, at least for now. Briggs and MikeÂ certainly haven’t been the same, but they haven’t for a while, even before season two. Now that he knows Briggs is Odin, what’s he going to do with that info once the case is over? He claims to be a by the book kind of guy but he’s been anything but by the book this season. Wonder if that will make him understand Briggs more? Briggs is a mess. He’s Odin. He lied about it repeatedly.Â This season, you could feel the walls closing in on him. And you could feel the weight of guilt on his shoulders. How is the Odin story going to resolve itself? He killed Juan in self-defense. At the time, Juan Badillo was pretending to be Jangles. Paul’sÂ true crime was tampering with evidence and the subsequent cover up. He could do time. Having said that, he’s been trying to beÂ on his best behavior this season. He helped Badillo’s grieving widow. He’s not partaking in drugs or tapping into any other self-destructive tendencies (other than lying and keeping secrets). He let his relationship with Charlie ground him in a way that he hasn’t been in a while, we’re guessing. All of that has been blown out of the water with the reveal that Charlie has that incriminating tape. However, one thing he hasn’t done is run away. He could easily do that. But he hasn’t. He might have to be the solid force that helps save everyone. Charlie’s in danger. Johnny’s in danger. From the looks of the promo below, Mike finds himself in danger. As for Paul, he’s undercover with those dirty cops and Sid is on to him. Will Briggs be in danger, too? 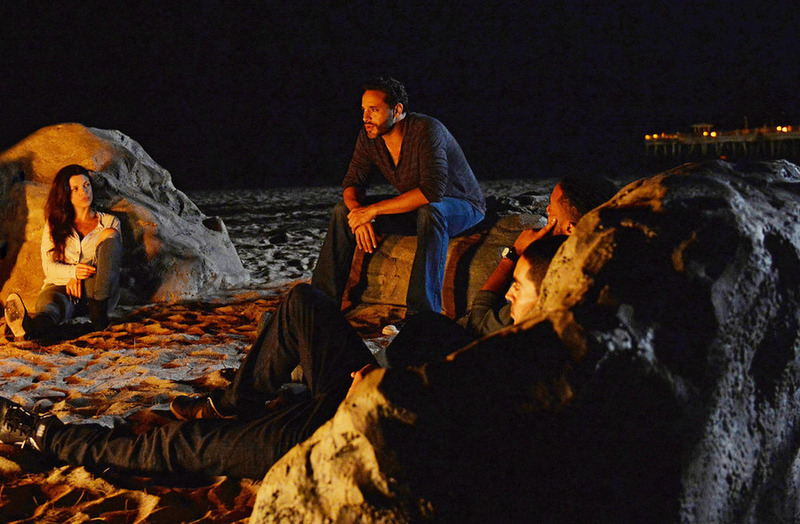 We’ll find out when theÂ Graceland season two finale airs Wednesday at 10/9c. Interactive Second-Screen:Â GRACELANDÂ fans can enjoy USA Sync while they watch the show and get production commentary, polls, quizzes and other content that they wonâ€™t find anywhere else. Get started atÂ sync.usanetwork.comÂ from any device.